Here's my contribution to Rima's digital workshop challenge on her blog Marazine. After saving the apple image I imported into Mac's iPhoto and gave it two effects Antique and Vignette. In photoshop under the filter gallery menu I chose artistic pencil and manipulated the pencil effects. I edited the color gradient. 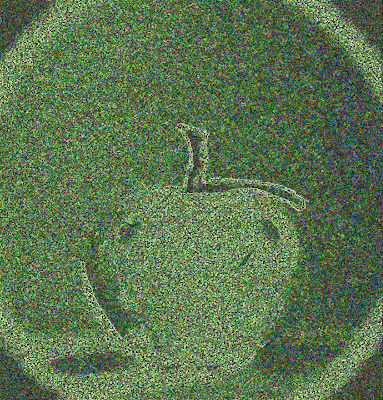 I then selected pointillize under filter gallery menu, sharpened edges and added glow edge. The title of my piece is dedicated to Georges Seurat who was one of the greatest pointillist artists of the 19th century. Have you stopped by my other blogspot:"ThE ArTfUl EyE"
I love it!!! I can't wait to learn more PS stuff! what a lovely site - followed the apple here....will revisit soon.